It was the biggest purchase of my life. I was 24 and a homeowner…well, condo-owner. It was a nice little two bedroom right off the Largo Metro Station, just a few minutes outside of Washington, D.C. The best part, I made the best investment a person can make. I was buying an asset. Something that would increase my net worth, put me on the road to wealth creation, and help bring about my financial freedom. Well, that’s what the realtor told me. I know this is a touchy subject. This topic has been debated many different places, including Ramit Sethi’s blog, with many different opinions. Luckily, you landed here with me. First and foremost, I am pro home ownership. When done right, it’s a great way to hedge against increasing rental costs with a fixed mortgage. It takes rent money and puts it to use and it can be a way to save without feeling like saving. I do have a problem with people spending more money than they should and calling it an “investment”. Going over your budget to get more rooms, square footage, and high-end finishes is not putting your money to work – it’s buying nice things, which can be fine BTW. You need to be honest with yourself, though, about why you are buying and what else you could do with that money. A home purchased as a home is an expense. 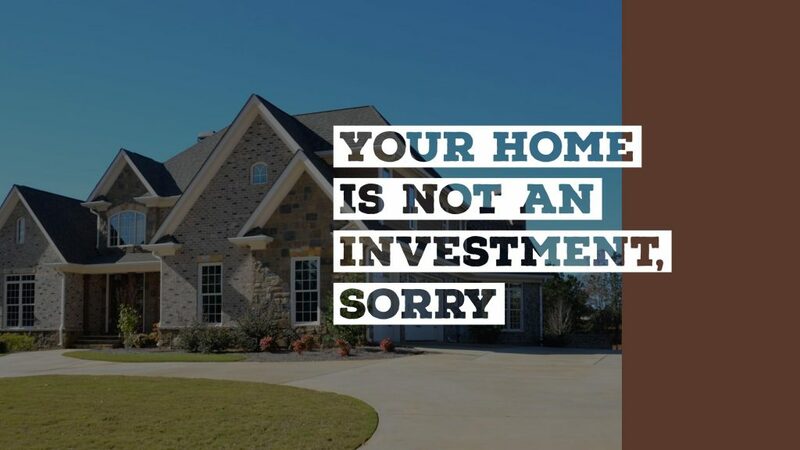 Only a home purchased as an investment is an investment. Let’s start with the term “investment”. An investment is something you buy with money expecting it to produce more money than it cost. If you bought a car in order to drive for Lyft, and you plan to make more money than the cost of the car, that car is an investment. But, if you just want to look good when you hand those Audi keys to the valet, that car is not an investment. When most people buy a home for themselves, they are not looking for an investment. They are not projecting population and development trends and its impact on appreciation to maximize returns. They are not running numbers to make sure their house appreciates more than inflation and the interest they’re paying. They are not comparing the return of a personal home versus the stock market or rental properties. Instead, they are looking for somewhere to raise a family. They are looking for enough space to comfortably live. They’re looking for good schools and sunny parks. They are thinking about using a house for their personal goals, not for its wealth-generating potential. Getting into the right mindset about spending money is extremely important for long-term wealth. If you are buying something for yourself, know that and buy accordingly. If you are buying an investment, make sure it will create more money than it costs you. Since many people tell themselves they are “investing” when they are actually making a personal purchase, they can ruin their finances. This was apparent with the U.S. housing crash in the late 2000’s. With fully gassed up heads (thank you realtors and mortgage lenders of the time), many Americans spent way too much on homes, telling themselves it was an investment. They were getting granite countertops thinking that every extra dollar put into the house and borrowed would lead to more money in the future. I can’t stress how important it is to approach this large purchase correctly and to be honest going into it. Being such a large purchase, doing it wrong will add years to reaching your financial goals. I tried to do it right, and I kind of did. When I graduated undergrad, I moved back home. I went to school near my parents, my job was in the same area, and I liked the idea of saving $1,000 a month. My parents are annoying to live with, but they aren’t $12,000 a year worth of annoying and it wasn’t going to be permanent. It was 2007 and all the kids (read: my friends at 23) were buying homes. We now know that would all stop soon, but I loved the idea of spending my money on an asset rather than just rent. I followed my own advice. I read a book on real estate investing, looked at multi-units and condos, and looked at comparable rents for all the properties I was considering. I landed on the aforementioned two bedroom condo. I put no money down, with a great loan from Navy Federal Credit Union. The comparable rents were about $300 above my mortgage and I felt good about renting it out when the time came. I was looking to go back to school to get an MBA (Master’s of Business Administration) and would need to rent the home. The conclusion … I survived. The crash caused my house to drop 40% in value. The crash also put a lot of people out of work and lowered rents in my area. I soon transferred to Atlanta from DC for work, leaving soon after to Boston for grad school. During that time, I was able to rent out my home, but at a monthly loss. I still have the property, and after a refinance, I now break even on the mortgage. Development in the area will let me steadily raise the rent over the next few years, creating cash flow. In addition, the mortgage is paid down every month by someone else, eventually bringing me back to have positive equity. In 30 years, no matter what it’s worth, I’ll own it outright and will have made money along the way. Sadly, two friends who bought homes at the same time lost them. One was through foreclosure, the other through a short sale. They both moved away and had much more trouble renting it out to cover the mortgage, as the homes were too expensive for their areas and weren’t purchased with renting in mind. Right now, I rent. The Bay Area’s insane housing market means it makes more sense for me (but maybe not you) to put my money into investment properties elsewhere. One way to guarantee you will make money on your home purchase is to put in some work up front. A “distressed” home is one that needs work. Simple things like old and stained carpet, outdated kitchen appliances, or damaged walls can result in significant savings for you as the buyer. This way, you can buy a home under value, allowing others who want everything perfect and turn-key to overpay. If you are adventurous, you can go for a real fixer-upper. When done right, you can add $50k to $100k in equity before you even move into the house. Renovation loans, such as a 203k, allow you to wrap the costs into the loan. If the one factory in town just announced they are moving, DON’T BUY! You don’t want to buy into the next Detroit (no shots) right before the decay. You want the part of town that used to be the hood (or maybe still is) and now attracts working professionals. New development and Whole Foods are always good signs. At a minimum, you want a stable area which isn’t about to see a massive exodus. Zillow will show you estimates in appreciation for the neighborhood you are considering. Zillow is not always correct, but offers a good starting point. Most people will scoff at the idea, but multi-units are a great way to have someone pay off all or most of your mortgage payments every month. If you don’t want a regular tenant and live in a desirable area, consider Airbnb or HomeAway to supplement your income. Personally, as I’ve started to look into buying in the San Francisco Bay Area, multi-units are the most attractive in terms of getting the house I want at a price I’m happy with. Owner-Occupied Multi-Units are an amazing way to get into real estate investing. You can qualify for a great loan with low down payments and great rates, and you can have someone else pay for all or part of your mortgage. The most important thing is to make sure you don’t buy something you can’t afford. Get a 30-year fixed mortgage at the best rate you can. General wisdom recommends spending no more than 28% of your monthly take home income on the mortgage, or a total cost of 3-4 times your yearly income. For example, if you make $80k a year, $240k to $320k is a good starting range. Remember repairs and other expenses, like PMI (which you should avoid), taxes, replacing the roof, etc. Don’t live a life focused on paying the mortgage. There are so many better things to live for. Buying a home is a big decision. Take into account your long-term financial goals, like you should with any major purchase. Don’t trick yourself into stretching yourself too thin by saying “It’s an investment”; and do a few basic things to make sure that in 15 years, you are sitting on a pile of equity and not a stack of late mortgage notices. Great points! The title itself reminds me of a key message from Rich Dad Poor Dad as well. You added a lot of personal touch though, and that helps the key themes stick. Thanks. I first read Rich Dad Poor Dad in college and reread it again this year. Hoping to help bring the knowledge to the masses and help fill in the gaps. Awesome post. I’ve been thinking about purchasing a multi family house in the Jamaica queens area. I’m currently renting in this area and I’ve noticed a lot of changes going on in the area. The first is a new Starbucks and chipotle so I know my area is about to start booming.